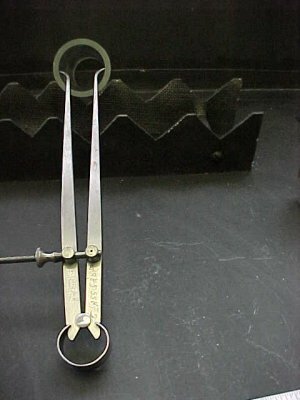 Vernier calipers (top) and electronic calipers may be two of the most widely used styles of calipers in the glass-shop. Electronic calipers are relatively expensive compared to the standard vernier style but they are not as tolerant to heat and chemical exposure. They are quite accurate, quick, and easier to read, however. 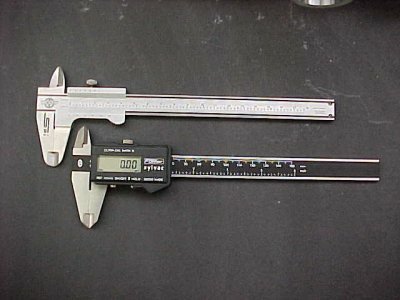 A vernier caliper measuring the outside diameter (OD) of a heavy wall glass tube. 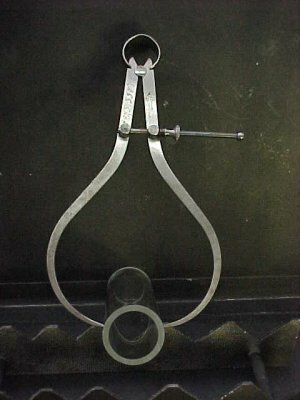 The two "prongs" on the top of the calipers are used to measure internal diameters. 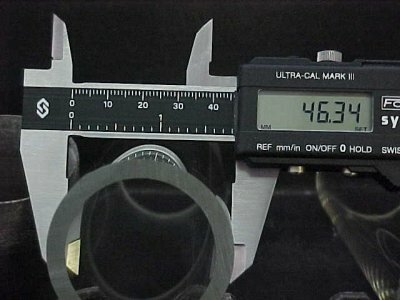 A close-up view of the calibration markings on a vernier caliper. 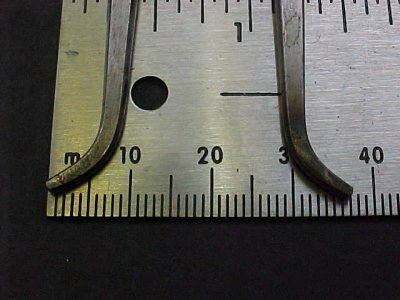 The upper markings on this caliper are metric and the lower markings are English. 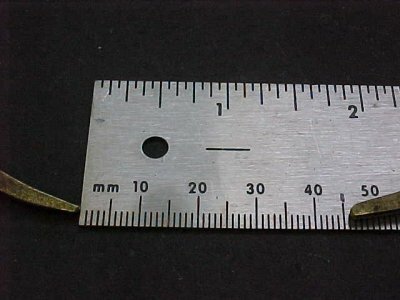 The measurement shown is 4.66 cm. Electronic calipers feature LCD displays. Most electronic calipers have a number of optional controls such as metric to english conversion, memory and adjustable start points. Spring-loaded OD Calipers are an inexpensive alternative to vernier calipers. They do have limitations - primarily in accuracy and versatility. Advantages other than cost may include increased measuring capacity or range, and heat tolerance when making rough measurements during the glass fabrication process. The horizontal threaded rod contains a thumbwheel for adjusting the width of the two measuring arms. Spring-loaded calipers do not have calibrations. 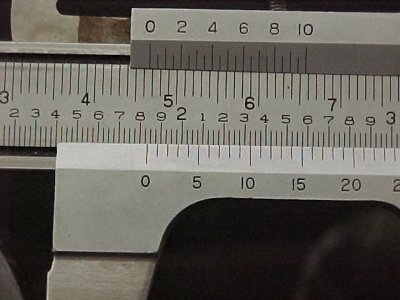 You obtain measurement by placing the measuring arms against a rule (stainless steel ruler with english and metric scales shown). As you can see, the accuracy of this tool and method does not compare with the accuracy of the vernier or electronic caliper. Spring-loaded ID Calipers have the same features and limitations of the OD Calipers. 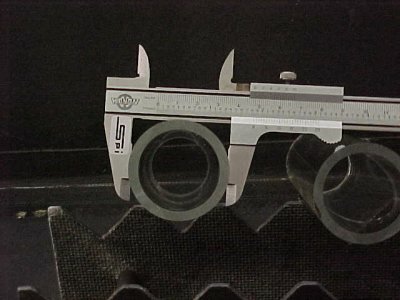 The difference is in the shape/orientation of the measuring arms, which allows access to the inside of the glass tubing. Obtaining a measurement with an ID caliper.